Now you can present a wonderful gift to your dearest ones as wedding gift. birthday gift. anniversary gift. any type of occasional gift. 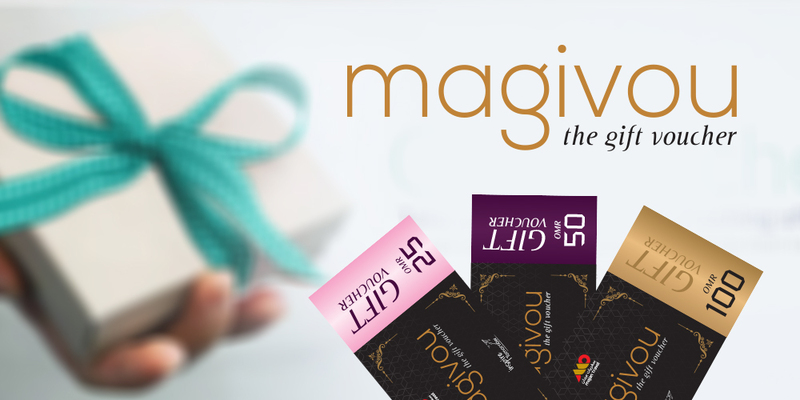 Gift 'magivou' - gift vouchers which can be redeemed to book flights, hotels, packages and any kind of travel services. It is available in 25 RO, 50 RO and 100 RO. •	This voucher is valid only for all travel related services available through any of the outlets of Majan International Agencies Travel & Tourism LLC. •	This voucher is valid only if signed and stamped. And it is valid only for 12 months from the date of issuance and extension is not allowed. •	This voucher is non-refundable and cannot be exchanged for cash in part or full and is valid for a single transaction only. •	We are not responsible if a Gift Voucher is lost, stolen, damaged or destroyed and no replacement will be provided in these circumstances. •	This voucher cannot be redeemed in order to purchase gift voucher. •	Not applicable for online Purchase. •	Only credit note will be issued against refund requests for any redeemed gift voucher. No cash refund permitted. •	While redeeming the voucher, the bearer is advised to provide ID proof. •	The management retains the right to reject any voucher that has been tampered with or found in any way unacceptable. Please note the terms and conditions of this gift voucher shall be amended at any time at the discretion of Majan International Agencies Travel and Tourism LLC and shall be binding on the customer.